I'm not trying to pick on anarchists like Hoppe here. Statist political scientists and politicians also oversimplify the world of politics and law with this false dichotomy. This usually takes the form of observing that modern governments have feature X, and by two invalid steps of logic (that X is necessary for government and that without such government there is only lawless anarchy) concluding that anyplace lacking feature X would be a lawless anarchy. "Anarchy" is thus used as a boogyman to justify all sorts of brutality, waste, and other wrongs perpetrated by modern governments. The United States federal government does not "insist that all conflicts among the inhabitants of a given territory be brought to [it] for ultimate decision-making", nor even that all disputes are "subject to [its] final review." Most disputes occur under State and local law, and the final arbiters of State law are State supreme courts. Only in the minority of cases where a dispute raises a question of federal law, or involves people from multiple states, do federal courts assert jurisdiction. Nor, of course, do States hold an all-encompassing monopoly of power -- many issues instead come under local or federal jurisdiction. Furthermore, federal, State, and local governments all have overlapping powers of taxation. In particular, this agent must be able to insist that all conflicts involving himself be adjudicated by him or his agent. Hoppe indeed identifies a serious defect in modern constitutions -- they violate the ancient common law maxim that no one should be a judge in his own case. But this defect is readily cured without the kind of radical from-scratch destruction and reconstruction of law and politics that the term "anarchy" suggests. The reforms needed to cure this defect (described in more detail here) are (1) selecting judges by a method completely independent of the other political branches, so that in no real sense would judges and those in other branches that they judge be agents of the same entity, or one the agent of the other, and (2) by reform of jurisdiction, for example by changing who has jurisdiction over constitutional questions. If federal courts were not selected by Presidents and Senates whose power they then judge, and if federal courts reviewed disputes involving state constitutions, and a super-federal court reviewed disputes involving the federal Constitution, so that they did not have final say over the scope of their own power, conflicts of interest of the kind that Hoppe rightly criticizes in modern governments would no longer commonly arise. What Hoppe is really arguing against can more accurately be called "sovereignty", the idea of one entity with a monopoly over all coercive powers in a territory, than "state" or "government." There are plenty of configurations of coercive power, in fact most such configurations over most of history, that do not involve this kind of sovereignty. In highlighting the problems of sovereignty I quite agree with him, but observe that the United States and many other historical and current polities are or were not "sovereign" in this sense, and many historical entities (such as the system of political property rights over most of English history) were not even close. Those of us who would like to greatly reduce the brutal and wasteful powers of modern governments do ourselves a great disservice by adopting the statist term "anarchist." Anarchy is the boogyman of statists. A libertarian calling himself an "anarchist" is like an agnostic or atheist calling himself a "Satanist." Seek not for imaginary opposites, but for real alternatives. There is a sense in which gene expression can be hierarchical: some genes are "master genes" that control the expression of many other genes. In other words, they select which genes to express when. It is thus entirely possible, and indeed in advanced organisms common, for a genome to encode a wide variety of phenotypes, only some of which get expressed, depending on the alleles of the master gene(s), on environmental cues, or both. Master genes can control gender, sexual orientation, and a wide variety of other complex structures and behavioral tendencies encoded for by complex assemblies of genes. The green beard effect occurs when linked genes produce all three of the following: (1) a signal, (2) recognition of that signal in others, and (3) different behaviors (e.g. altruism) towards those exhibiting that signal. If the genes can remain linked, organisms expressing the green beard allele can cooperate with each other and spread in the population. Most evolutionary biologists, studying the genetic evolution of behaviors in animals, have tended to dismiss green beard effects as rare, because they have only rarely been unambiguously observed in the field, and because it's highly unlikely that genes can remain linked in this manner during sexual recombination. I strongly suspect that this view is mistaken. It's hard to distinguish green beard from normal ("blue beard") signalling and recognition systems (such as those involved in kin altruism, mother/fetus interfaces, sexual selection, gender recognition, etc.) Green beard effects usually evolve "parasitically" on already existing "blue beard" signalling systems. Both of these make it difficult to recognize green beard effects, because they are usually strongly associated with existing "blue beard" signalling systems. Furthermore, strong linkages are not nearly as rare as has been assumed, because of the existence of master genes that control the expression of many other genes. Alternative alleles of a master gene could, for example, code for the selective expression of alternative strategies encoded in many other genes. In other words, a wide variety of genes, each existing in all members of a species, could code for two or more complex strategies, with a master gene coding for which of the strategies actually gets expressed. The remarkable thing about the color morphs of side-blotched lizards is that an enormous range of behavioral, physiological, and life-history traits are correlated with throat color. Genes for different traits can be linked physically if they occur close together on a chromosome, but according to [evolutionary biologist Barry] Sinervo, throat color is linked to far more traits than could possibly be physically linked on the same chromosome. It's almost as if the whole genome is tightly tethered to this one master locus," he said. "In order to be a really 'good' blue, you have to have all these other alleles [of different genes] lined up in the right combination, and the same is true for orange and yellow color morphs. So there is strong selection for these different fitness combinations. The lizards, the throat color gene determining orange, yellow, or blue throat splotches seems to be tightly correlated to the rest of a distinct complex strategem. This is inexplicable by traditional arguments against the green beard, which assume that the alternative strategies are coded in three separate sets of alternative alleles, all of which must be expressed to work. Being broken up and recombined every generation, they cannot stably evolve as distinct and competing sets of genes. But the cooperation of the blue-throated lizards qualifies as a green beard effect, bringing this assumption into question. 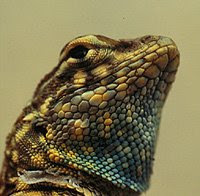 The linkage of throat colors with complex behavioral strategies can be readily explained if all three strategies are encoded in all male side-blotched lizard genomes, and there is only one strong linkage, that is between the throat color gene and a gene that controls the expression of many other genes. Indeed, I wouldn't be surprised if the throat color gene and the master gene were the same gene. There are strong adaptive reasons for master genes to control complex assemblages in this way. Behavioral strategies, and indeed structures and metabolic pathways, that are too complicated but not ubiquitous in a breeding population are encoded across too many unlinked genes. As a result they cannot survive sexual recombination. All advanced multi-cellular organisms thus have master genes or distinct chromosomes that control the expression of many other genes. In the case of gender, distinct chromosomes are usually involved, but master genes can behave similarly, producing small sets of complicated strategies, each strategy very distinct from each other and each a distinct alternative to the other. In information theory terms, there is a large information distance between each of the alternative strategies, just as there are many differences between the genes expressed in the development of a female versus those expressed in a male. A wide variety of distinct morphological and behavioral traits are bundled into a small number (in the case of genders, typically two) of alternatives. A wide variety of other genes encode the distinct complex structures or strategies, to be invoked by master genes, developmental stages, and environmental cues. Since the complicated parts of each strategy are encoded in every member of the breeding population, there is no problem with sexual recombination breaking linkages between many genes encoding each strategy: each gene of each strategy is still there waiting, in the next generation, to be invoked by the master gene. I strongly suspect that master genes and green beard effects analyzed in this manner will shed light on a wide variety of puzzles in evolutionary biology, including sexual selection, sexual orientation, and racial and ethnic preferences that, under the assumption that green beard effects are not important, have long defied analysis or been assumed to be purely environmental. prices become much higher than the costs to produce the resource, the opposite situation from competitive markets in other kinds of commodities. Yet resource owners restrain production without the need for a cartel or any coordination. This occurs because, under the Hotelling assumptions that the commodity is not renewable and cannot be substituted for (and of secure property rights, as David Friedman correctly points out) the commodity producer can choose between producing today or keeping it in the ground to produce tommorrow, with no fear of permanently losing sales to some competitor. Any sales lost to a competitor today draws down the competitor's fixed stores and can be recouped at any time in the future. What the Hotelling model does not properly account for is that these very characteristics also make these goods great substitutes or hedges for money. Hotelling looks at a "fixed" or "prevailing" interest rate, but we should really be looking at expectations of future interest rates, taking into account expectations of future inflation. And we should account for changes in these expectations. If we do so, I think we will find the model to have high explanatory power (albeit not high predictive power, since we can't outguess the market about future monetary conditions -- but the search for predictive as opposed to explanatory power in economic models is largely futile anyway). Imagine a world with two currencies C1 and C2 and two nonrenewable minerals, M1 and M2. C1 money supply outstrips money demand by 10%/year, and for C2 by 5%/year (in other words, C1 "inflates" or "falls" by 10%/year and C2 by 5%/year). If the price has not properly increased to account for future expected inflation, people will prefer holding M1 and M2 to holding either of the currencies. They will play "hot potato" with the currencies: as soon as they obtain a currency in trade, they will try to purchase M1 or M2 with it. All holders of M1 or M2 will demand a stiff premium to exchange their minerals for falling currencies. What premium will they charge? In theory, the inflation premium is infinite: it is a "net present value" calculation of the depreciation of the currency into the infinite future. In practice, (as with the St. Petersburg paradox, and because no commodity is perfectly nonrenewable or perfectly immune to substitution over the long term), the premium will just be very high: not only far higher than the cost of production, but also far higher than the Hotelling model under the assumption of no inflation. Inflation expectations will dominate the prices of M1 and M2 in C1 and C2. Now imagine that inflation expectations change. If expectations of inflation in C2 to infinity go down from 5% to zero, we have in theory a change of net present value of revenue streams from M1 and M2 in currency C2 from infinity to zero, and in practice just a very high drop. It takes only a small change in inflation expectations to send the prices of M1 and M2 in C1 and C2 soaring or plummeting. Since the standard Hotelling model predicts no abrubt price changes, and the monetary model does, the monetary model is a better choice for explaining the actual dramatic price movements in relatively nonrenewable commodities such as oil that we have observed. Under imperfect information, since we have far better information about geology and technology than we do about future monetary conditions, and since uncertainty in monetary conditions produces far greater price changes than uncertainty about geology and technology, we can again conclude that abrupt changes such as we've seen are due almost entirely to changes in monetary expectations rather than in "fundamentals". Furthermore, when we see dramatic changes across a wide variety of commodities, being led by the less renewable commodities like oil, Occam's Razor (or equivalently, basic probability) tells us that there are not 100 different explanations for why 100 different commodities have all gone up dramatically. Rather, we need only two quite related explanations: changes in inflation and inflation expectations for the currencies they are priced in. Two commodities that come relatively close to being Hotelling nonrenwable commodities are gold and oil. For gold, the above-ground stockpiles are far greater than the annual production. For oil, the below-ground stockpiles are far greater than the annual production. The price of gold has always historically been dominated by its role as money, monetary substitute, or hedge, or equivalent, and the price of oil is also coming to be so in an age of floating currencies and in the current decade of rising inflation expectations. When we realize that Hotelling nonrenewable goods make better long-term stores of value than less renewable commodities, we can explain why, while all commodities have dramatically risen over the last three years, the surge in oil has been disproportionately dramatic, and even more dramatic than the rise of gold: the rise in oil combines an increasing use of oil as an inflation hedge (mostly by the producers themselves curtailing production), which effects oil but not gold (which has long been used this way), with increasing inflation expectations (which effect both gold and oil, and other commodities to a lesser extent). It is often noted, in rebuttal to the theory that the falling dollar is mostly responsible for commodity price rises, that the dollar has fallen less gainst the euro, or against a basket of other currencies, than oil and many other commodities have risen in dollar terms. In other words, oil and most other commodities have also risen in euro terms, just less so. There are a number of problems with this argument as a way of dismissing monetary causes. The first problem is that these statistics only record falls relative to other currencies. It assumes there is some currency out there, or some basket of currencies, that is a stable standard of value that we can measure against. But there isn't. It's quite possible, and indeed currently quite probable, that the euro etc. supply has also inflated (relative to demand for the currency), so that all major currencies are falling relative to a hypothetical stable standard of value. They are just falling by on average less than the dollar is falling. Just because there is no standard to measure them against doesn't mean they can't collectively fall (or equivalently, that they can't all collectively inflate, as defined by greater supply, less demand, or both for the currency). (1) More dollars chasing the same (in the short term relatively inelastic) supply of commodities. This directly effects only the dollar prices. (2) Greater demand for commodities as a substitute or hedge for currency-denominated debt, to hedge against further possible inflation. Small changes in inflation expectations, as discussed above, can have large impacts on commodity prices. This increases commodity prices in all currencies. (3) A flight to safety from the credit crunch, creating more demand for safer forms of debt (e.g. U.S. Treasuries), and thus even more demand for commodities to hedge the currency risk from holding that debt. This increases commodity prices in all currencies. No "manipulation" or irrational "speculation" is required to explain commodity prices, and there may not even be a bubble (although a bubble could easily arise under such conditions of high uncertainty). Rising commodity prices, and in particular the disproportionate surge in oil, are mostly or entirely just a rational and efficient response to the poor state of the world's floating currencies and the credit crunch. (This post is based on previous comments I have made at other blogs, including in response to Hal's post linked to above). The United States Court of Appeals for the Federal Circuit, which usually has the final say on most U.S. patent appeals, and thus the most influence on the development of U.S. patent law, has recently been eroding conservation of rights, the principle that you cannot sell or claim more than you own, and in particular that you can't reclaim it once you sell it. Under the patent exhaustion rule, which is as old as patent law itself, patent rights are exhausted upon the first sale of an object embodying the patent. The patent holder is effectively allowed to sell the patent rights once per object, rather than maintaining control shared control over the object with the object's owners and possessors through its entire lifetime. The patent holder is allowed to collect a royalty only once per object. Once the first sale occurs, the object reverts from being held in a tangle of intellectual property, with a potential wide variety of "owners" imposing a wide variety of restrictions, to being owned outright by a single person or express partnership as traditional (i.e. real or personal) property. The Federal Circuit has eroded this principle in a number of ways: by ignoring foreign sales (so that for example an object first sold in Canada under a Canadian patent, then imported into the U.S., comes under the thrall of the equivalent U.S. patent), by excluding certain kinds of patents from the rule, and by changing the default rule for implied licenses (i.e. ruling that the default implication was that resale was not allowed, effectively extending patent rights beyond the first sale), etc. In some cases patent rights seem to disappear, but then reappear later on in the lifetime of the object. In other cases the patent holder maintains a continued shared control of the object over its entire lifetime, despite any changes of normal ownership and possession over the object. judgment of the Court of Appeals [Federal Circuit] is reversed. LGE points out that the License Agreement specifically disclaimed any license to third parties to practice the patents by combining licensed products with other components. But the question whether third parties received implied licenses is irrelevant because Quanta asserts its right to practice the patents based not on implied license but on exhaustion. Imagine Alice could make a contract with her friend Bob which gave Alice the right to confiscate things that you or anybody else bought from Bob. If property rights would be confiscated from third parties by contract on ad-hoc basis, there would be no effective property rights. Contracts should never be able to impose duties on third parties. Only property law (via deeds, licenses, etc.) can impose duties on subsequent owners or licensees, and these transactions should strictly adhere to conservation of rights and intellectual property exhaustion if they are not to interfere with others' property rights. For property deeds to impose duties on subsequent owners, they must either be clear from the object itself (e.g. a physical object is obviously personal property clearly belongs to somebody) or they must be clearly written and publicly recorded (e.g. liens on personal property, real property deeds that define property boundaries and restrict use of the property, etc.) Furthermore, there should generally be one set of restrictions based on one owner per object, or simple and well-known variations on that (e.g. joint tenancy), not a wide variety of restrictions stemming from a wide variety of people who "own" the object in different ways, i.e. intellectual property owners. An intellectual property license, when as here is not clear, should be construed to follow the default rules of intellectual property law, especially those rules like patent exhaustion that preserve a standard sphere of traditional property rights not entangled in a web of intellectual property. My kudos go out to our highest court for defending traditional property rights against further erosion by the Federal Circuit's pathological interpretations of intellectual property law. Here is Dennis Crouch's take on the case. I am quite chagrined that a number of influential folks have almost reached the same conclusion as I, namely they've concluded that "speculation" not fundamentals are driving most of the recent commodities rise, yet they reach a policy conclusion that is utterly insane: restrict or ban much of this "speculation". They stop at the word "speculation", repelled in horror by the idea, and don't take it a step farther -- ask why this "speculation" is going on. A good clue comes from those responsible for the biggest piece of it -- retirement funds. Retirement funds have long been heavy, relative to other kinds of funds, on less volatile (over <15 year periods) investments like bonds. But bonds are mostly denominated in dollars. With the threat of dollar inflation (apparent from the recent drop in the dollar, from recent Fed activity, and from the history of the floating dollar in the 1970s) they have a fiduciary responsibility to protect their investors' retirement nest eggs by hedging bond positions with commodities baskets. And that is just what they have been doing. Besides providing an inflation hedge and a performance comparable to bonds since the dawn of the floating dollar era in 1970, commodities are also "anti-correlative", i.e. they tend to move in the opposite direction of stocks and bonds, substantially reducing the risk of the overall portfolio. To suggest that commodities are not proper vehicles for investment in this era of the floating dollar is stunningly pathological, but that hasn't stopped a number of people who should know better from suggesting this. (I suspect a similar explanation is behind much of the high Chinese demand -- but that rather than buying futures they are actually stockpiling commodities, including cutting back on production of the mineral reserves that they own, to hedge their peg to the U.S. dollar, their massive dollar earnings from exports, and their heavy investments in U.S. Treasuries, all of which are vulnerable to dollar drop or inflation -- but I don't know where data on such stockpiling activity might be readily available). Many of these retirement funds can be politically influential. I wish, for the sake of the retirees they have a duty to protect, they would defend themselves politically against the insane proposals to restrict or ban commodity index funds. Those seeking to save for retirement have perfectly good and strong reasons for investing in commodity indices: they don't want to see their retirement funds eroded away by inflation, as happened to millions of seniors in the 1970s. More generally, people have a right to be free from ignorant government interference and federal spite when they choose to hold their savings in forms protected from the erosion of the dollar. Commodity index exchange traded funds (ETFs) have allowed people to construct, without many of the costs, risks, and complexities of direct purchases of commodity futures, retirement portfolios hedged against inflation. Portfolios protected against inflation are an exceedingly valuable asset both for the retirees and for the society on which said retirees will be less dependent. They are also quite valuable for many other kinds of investors, such as college endowments that lower the cost of tuition for future students and fund research that benefits the future of us all. Instead of attacking the fever by shutting down the immune system, i.e. instead of attacking the commodities indices needed to hedge against inflation, it is the prior main cause of the problem, Federal Reserve monetary policy, that needs to be addressed. The Fed needs to put a higher priority on preserving the value of the dollar and fighting inflation, and it needs to use leading indicators (e.g. commodity and foreign exchange prices) far more than trailing indicators (e.g. CPI, PPI) in this task. (I understand of course that the recent credit crunch has probably been a very good reason for the Fed to "print dollars." That doesn't change the fact that the Fed is smack dab in the middle of the causal chain that has led to the commodities boom, and that savers have a right, and investment funds a fiduciary duty, to protect their savings against the inflationary effects of Fed policy). It's certainly possible that some of the commodities boom is a bubble. It is often the case that economically efficient bull markets become overextended into wasteful bubbles, it being very hard to tell just how large of a price increase is actually warranted, and we may be seeing some of that now. (These bubbles are allowed to occur by a lack of available instruments for speculation, especially the transaction costs involved in holding long-term short positions against markets that may rise substantially further before they fall. The worst way to combat a bubble is to ban the last modicum of imperfect speculative mechanisms such as short sales that currently prevent bubbles from getting worse). There is no easy way to gauge just how much retirement funds and others seeking to hedge inflation need to allocate to commodities baskets in order to optimize their portfolios, because it depends greatly on future Fed behavior. On the one hand we know that hyperinflation has sometimes occurred historically with floating currencies, so that dramatic further increases in commodity prices are possible; on the other hand the farther commodity prices go up (and they have gone up very far indeed) without corresponding inflation in other goods and services, the more downside price risk there is in commodities. Oil next year might be $40 per barrel, or $300 per barrel, or anything in between. It's certainly true that commodities have become a far riskier, i.e. more volatile, investment than they were three years ago, and that puts a severe limit on the proportion of an investment portfolio it makes sense to devote to commodities. But that proportion is certainly nowhere near zero as the lunatic anti-"speculation" activists would have it. (This post is based on a comment I made on a previous post. Here,, h/t to reader "munin", is a hedge fund guy who reaches almost the right theory, but the abominable policy conclusion, and is the source of the graph above. Here is some of my previous writing on this subject: The Monetary Value of Liquid Commodities and Commodity Derivatives: The New Currencies). [Update: at least we don't have war hysteria (or click to enlarge the facsimile at left). Note that Herber Hoover, who many history books still proclaim with preposterous prevarication to have been a free market guy, and who later presided over the start of the Great Depression, was at this time (1917) the head of President Wilson's Food Administration, which came up with this plan for "Control of Food By Government". Hoover's food plan, like the crazy plans to "fix" the commodities markets today, was designed by and for the ignorant and the paranoid, targetting "Evils" of "Unreasonable Profits, Speculation, and Hoarding", i.e. the "evils" of people stocking up to ensure own and their customers' future food supply instead of letting the benevolent Herbert Hoover control it for them. Today it is apparently evil to protect your retirement nest egg instead of letting it fall with the dollar].